WORTHING Rugby Club’s ladies team kicked off the new year with a 17-10 win at home to Portsmouth on Sunday. Having previously competed against Portsmouth in the league last season, the home side knew they would be in for a tough match, after a long Christmas break. The first quarter of the game was even, with both teams attacking and defending the halfway line. Worthing crept ahead when a well-timed chip and run from winger Amy Martin livened up the attack. A break off the line-out from skipper Jess Lovenbury led to her sister Rebecca Lovenbury steaming down the wing to give Worthing their first five points. Portsmouth fought back and some sloppy handling from Worthing in front of their own posts allowed the visitors to intercept and make the half-time score 5-5. The second half saw Worthing stuck in their own half straight from kick-off. Multiple moves from a team dominated by forwards, led to a well-earned try for Portsmouth, who took a 10-5 lead. Worthing quickly responded as centre Jade Widdows made a pacy dash and opened up a chance for number eight Holly Blackhurst to power over to level the score. The attacks from Worthing continued, with huge tackles from Chrissie Dowling and Lauren Sandford keeping the play at the Portsmouth end. The hard work paid off as Widdows burst through to score and Sandford converted. 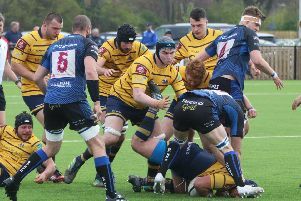 Worthing travel to Jersey on Sunday for their next league fixture.